Nestled along the Los Angeles river in the small neighborhood of Elysian Valley, (commonly referred to as Frog Town) is Nomad Gallery, a space unlike any I’ve stumbled upon in this city. The founder, Damon Robinson, works on printmaking, woodcutting, and occasionally chases one of his giggling, paintbrush wielding kiddos as they cruise past the barbers chair (the barbershop is yet another perk of this spot). Passersby are encouraged to drop in and peruse the gallery or workspace and will always be greeted by Damon or one of the other artists-in-residence during open hours. I recently sat down with Jen Hitchcock to talk about her new bookstore and book club, located inside the gallery. Hi Jen! Can you tell me a little bit about your decision to open up a bookstore? I worked at EMI Music Publishing for a long time…I’ve worked in that field for almost my entire adult life. A couple of years ago some corporate crap happened, the company got bought out, and I eventually got laid off. I knew it was coming and I wasn’t happy with my job, so I was finally able to ask, “What do I want to do with my life?” I didn’t see myself continuing on in this stifling, corporate world. I’m a writer and a creative person. I hated having to go through a chain of people to approve all of my ideas. I kept thinking about my love of books and music and decided to open a bookstore that incorporates both of those interests. That idea is how I came up with the name, Book Show. Initially I thought I would have a traditional storefront, but then I came here. Damon (owner of Nomad Gallery) mentioned that he wanted to bring in a retail element to the space and I decided this was the place to bring my idea to life. I love how the space here has been transformed and it’s obvious that the book selection is carefully hand picked with goodies. What inspired you to put the store together in this way? Thank you! When I go on trips, I always stop at roadside attractions. I love cabinets of curiosities, circus themes and carnivals. What I like is that they bring travelers in and then it has the ability to educate. I’m also a historian by nature. I like learning about how books fit in with the historical context of their time. The book selections are things I find really interesting, whether it’s classic literature, zines, local writers, or something I’ve picked up without knowing anything about it first and am excited to share. 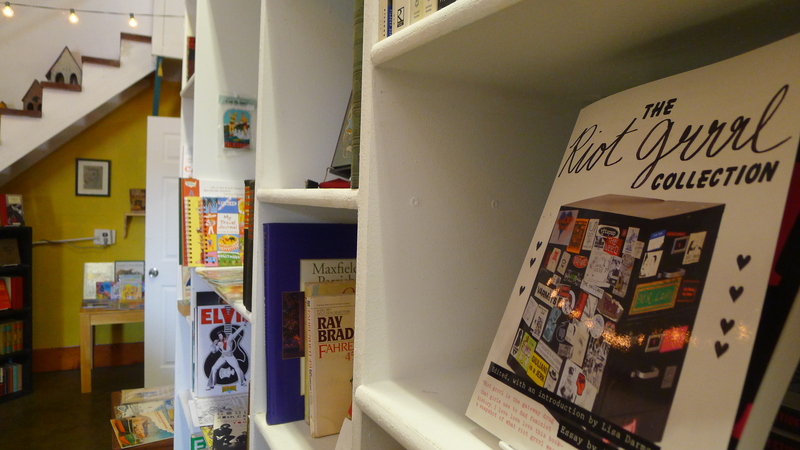 Obviously, the zines you have for sale are a favorite of mine…. I want the section to keep growing. I created a zine in the 90s that was very cut and paste, called ZYZXX. It was filled with music, photos and interviews (one with Vaginal Crème Davis for example). I’m just now coming back into the zine world and I’m blown away with what I see today. I want local writers and artists’ work to be celebrated here. Join us for the introduction to Fringe Readers, a book club celebrating independent, underground and DIY literature at Book Show on Thursday, September 5th at 8pm. 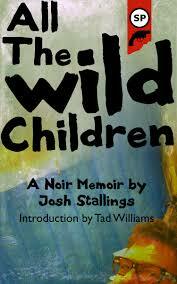 Josh Stallins, author of the first book selection, All the Wild Children, will be stopping by to read from and discuss his work. 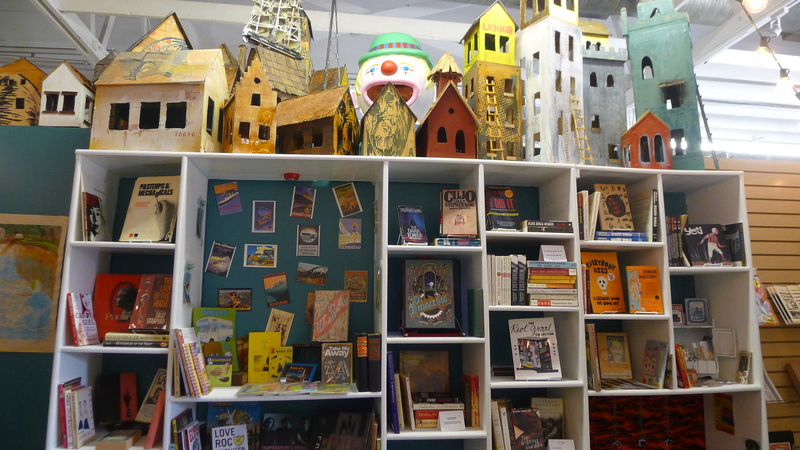 Book Show is located inside Nomad Gallery at 1993 Blake Ave. Los Angeles, CA. 90039. Regular Store Hours are Tues-Sat 10am-6pm and Sunday 12-5pm. Closed Mondays.